is the Sunset Junction street fair held each year near the end of the summer. last year Tsar played and Elliot Smith and some other bands whom i dont remember because this street fair goes really long into the night and the roads are closed and the freaks come out and if theres a party where they have ferris wheels, henna tattos, clowns on stilts, and chicken on a stick then im in. plus this is a street fair in hollywood, friends. the amount of people-watching is unmatched, and that goes for any street fair in america, and ive been to them all. 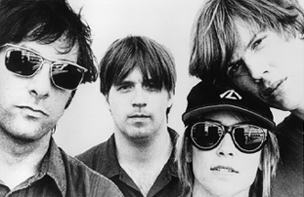 this year the headlining musical acts include Sonic Youth and Mudhoney on Saturday and Sleater-Kinney and Pansy Division on Sunday. I think Mary Wells and Chaka Kahn will also be performing, but since Los Angeles only has one newspaper, and its online arm only bothered to give a one paragraph pre-write on the coolest happening this weekend, then i may have to rely on you, my good readers, to clue us all in via the suddenly barren comments section. Sunset Junction: $6 “donation” – thats what im doing this weekend.